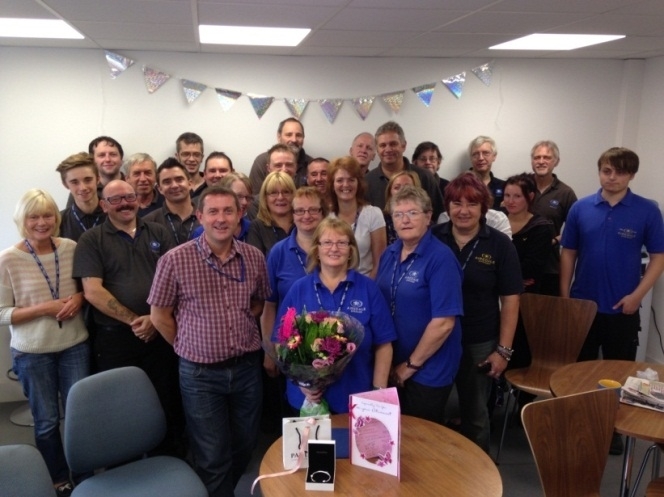 September saw the retirement of one of our Senior Operatives Jean Powley. Jean has spent over 41 years with the Company working in many different departments. During the 1970/80s Jean was one of 5 sisters who worked for the Company at the same time. She married David Powley one of our senior setters in 1994. His father, mother, brother and sister in law all worked for the Company at the same time. Airedale Springs is a family Company in more ways than one! All the staff had a send off for Jean on the 4th September and we wish Jean a very long and happy retirement. Picture – Jean Powley (centre) with Sean Parkinson Commercial Director and fellow colleagues.